Happy Sunday everyone. Today I bring you a card I made in which I call Crazy Birds Friends. This card was made on HP glossy photo paper cut to 4 x 5.25. I used Tim Holtz Alcohol inks in Citrus and Sail Boat Blue to make the background. 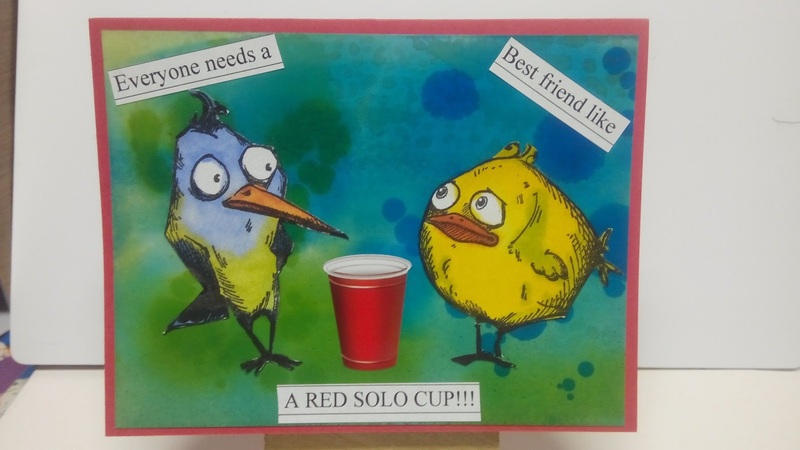 The Stamps are Tim Holtz Crazy Birds colored with Zig Clean Color Real Brush Markers and the Red Solo Cup is a sticker by Stickos. The sentiment I typed out on my computer and printed on Neenah Bright White cardstock and cut to size. LOL....love the red solo cup! Such a fun card!